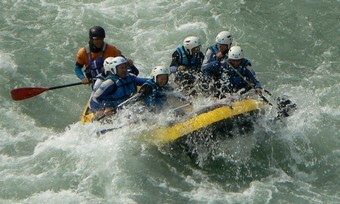 Rafting in the rivers of the Huesca Pyrenees is one of the most popular activities. 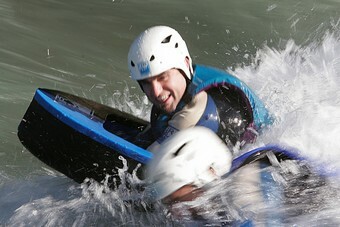 In addition to rafting, hydrospeed or kayaking increase the activities most in demand in rivers with significant flow. Since there are no rivers in the Sierra de Guara with the ideal characteristics for rafting, it is necessary to move north, looking for the great rivers of the Pyrenees, such as the Esera, the Gallego, the Ara, etc. Rafting consists of going down the river, riding on a raft, and getting around the rapids with the help of oars. The rafts usually have 6 to 8 occupants and the descents last around 2 hours. Each boat is guided by a professional guide. Unlike rafting, in which we all ride on a boat, in hydrospeed each participant carries a kind of aerodynamic iron on which he or she rests halfway up the body, with his or her legs in the water and his or her feet fitted with fins to facilitate propulsion. Contact with water is more direct. 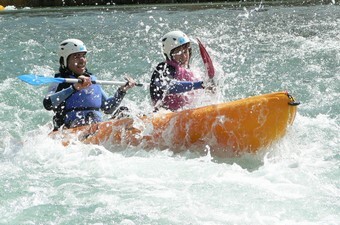 Canoeing, like rafting, is a fun activity aimed at everyone. With some basic technical notions, taught by our professionals, the canoe allows you to sail independently and visit places that are difficult to reach by other means. Emotion and laughter in an adventure activity ideal to enjoy with your loved ones, and a perfect complement to canyoning activities. It is mandatory to know how to swim 1 day or 1/2 day.